Lightweight browsers are an alternative to heavyweight or mega browsers because many people need a browser that will run on older systems or simply one with fewer features. The lightweight browsers offer a large variety of alternatives from the traditional heavyweight browsers. This review highlights the key features of each lightweight browser and specify if the browser is good for older systems or has unique functions. Browsers that have not been maintained by the developer for 12 months or longer will not be considered. All the reviewed browsers will have the essential features of a quality browser including active security, web search, privacy viewing, pop-up blocking, download management, plug-in and extension support. This page covers Lightweight Browsers. Read also our reviews on Mega Browsers and Specialised Browsers. Screen capture, spell check, Site Groups, form Quickfill management, Photo management, and Social Networking. Include Site Groups, and Social Networking. No longer be further developed due to the performance and compatibility issue. Built-in features: Download accelerator, Media manager, Torrent manager, Music player. There is an outdated reference here to Slimboat at a compact 11.7 MB. The address www.slimBOAT.com redirects to www.slimJET.com, where the Slimjet browser at a sizeable 41+ MB may be downloaded instead. I wanted to take a look at the Torch browser, but it has a statement on the opening page of installation it states: "Requires installation of Movies App by Ask". There is no option to opt out. I tried to Google "movies app by ask",but nothing really came up. Does anyone know of this Movies App? It does not come up now (a slightly different download site comes up) , so I do not know why it did before. The Torch site is green. There is more of a clue in the link contained in the one comment on the WOT page you posted. This discussion centers around bundled components some of which relate to movies so this is the likely association. It is common practice nowadays for software authors to include unwanted components with their main product. Where they use a wrapped installer, the makeup of these components is variable and also likely outside of their control. The VirusTotal reports for both the offline installer and that obtained via their site show unwanted components. Additionally, Dr. 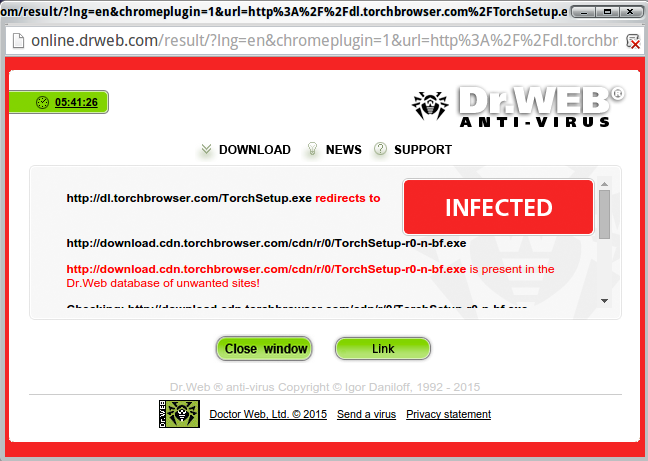 Web reports their site link as infected. MC – Site Manager. Thanks. That is enough information for me to stay away from Torch. just have to add to my prior comments: there's one more browser- Maxthon Nitro ( from FlashPeak ), and it is fast; it isn't yet stable, also, it doesn't import Favorites ( You have to create them from scratch), BUT it is fast, no glitches, no crashes. Try. I'm quite sure, You'll like it. A.Raa. here is my latest find in group of supersmall browsers- '32 bit web Browser', just 1 mb, can be downloaded as .exe and not necessarily 'saved', but just 'run'. And, just like in case with 'B.O.B. Rapid browser', little bit of manual work and tweaking required to create 'bookmarks'. Sites are opening fast , no glitches, domestic and foreign. ( and fun is in variety ). A.Raa. now: recently I"ve discovered Polarity browser and B.O.B Rapid browser, both are extremely small- 1 mb and 826 kb accordingly , both downloading in .exe form, to be open on the screen all that is required is to click on the icon and click 'run"; both are very fast and do everything that their big brothers do, Youtube works fine, every page I called on the screen, including foreign, opened fast, there is no freezing, nor crushing. So, I"m quite content. Perhaps, someone else will be too, when tried. Thank You. 'till we meet again. A.Raa. I let it sit for several hours and it finally froze up with over 1700.0 mb of memory usage... worse them chrome!! Thanks for the info. I will be updating this article when I am back on deck. Approximately related to "lighweight browsing" I would like to recommend checking out "site specific" browsing, which is basically a browser window dedicated to a single website. For trusted and frequently-visited sites (e.g. gmail, youtube, soundcloud, grooveshark) I find this to be an excellent solution. As far as I know there are only two programs worth looking at for this, which are SisterB and Bazinga. Mozilla Prism is also still available though as well with a bit of hunting, and it works ok too. For a more recent/supported approach there is the "Quick Apps" feature built in to Maxthon - this is my own preferred method at the moment. I think Chrome has something similar but it requires Chrome to be already running in the background, while the Maxthon-created browsers are truly independent. I just noticed that Maxthon itself doesn't get a mention here ... I have noticed that it's a little CPU-heavy at times on my low-end hardware, but nonetheless it it's still an excellent browser for general use. It lacks add-on support and detailed cookie/script management but it is regularly updated and for my money is probably the best no-frills browser available at the moment. Isn't there a web browser that just browses the web? No social media, no grouping, no whatever else. Just see the web pages as the designers want you to see them and watch videos or listen to audios that are on those web pages. I'm using Palemoon, so it already does all the extra stuff. I was hoping lightweight really meant lightweight. Bare minimum. The introduction clearly defines what "lightweight" means here: it uses less resources than the heavyweight web browsers or that it has more limited features. Lightweight doesn't mean the bare bones, the bare minimum of features, because "active security, web search, privacy viewing, pop-up blocking, download management, plug-in and extension support" are generally considered to be required features today. I was disappointed when i read the description of lightweight. Web search isn't that what google duckduckgo and all the others are there for? With that definition of lightweight, PaleMoon is probably lightweight. The previous editor set the features for this category. I don't plan to change them because they reflect contemporary web browser design. But when I get the time I will be rewriting this category and its recommendations. The features that you don't want are more basic than you realize: + Download management is as basic as the ability to see what is currently downloading, locate it on disk, and stop an active download. I remember when browsers didn't have any of that. + Web search is basic integration which provides the ability to choose different search providers and change them very simply. This is often provided through plug-ins and extensions. + In recent years most general-purpose web browsers have added plug-ins and extensions. This means that additional features can be added as required. Heavyweight browsers provide many features as standard, e.g. PDF readers. Palemoon is not lightweight because it has above average resource usage. As a 64-bit application it has higher memory usage than most 32-bit browsers. It does have a reduced feature set but the more fully-featured Waterfox, which is also 64-bit, outperforms it on resource usage. Really, i thought PaleMoon was optimized to give the best performance. I switched to PaleMoon when Firefox became weird with a new builky interface or something. I have never heard of Waterfox. I'll go take a look in the heavyweight browsers. It looks promising, but it's in alpha. From comments on the Maxthon community forum, Nitro doesn't seem to have impressed people much re; speed and resources compared to standard Maxthon. Also the available alphas/betas are install versions; there is no portable version yet. You guys are the best. Thanks to this article and the user comments below I have just revived my old laptop I was about to throw in the garbage. My 9 years old laptop (1.6 Ghz CPU, 512mb RAM) was struggling with literally everything while browsing on the internet using Chrome or Firefox. Firstly I tried Comodo Dragon, and it did the job fairly good (except YouTube playback, it was laggy). Now with Slimboat it is unbelievable how good it performs with heavy pages and a few open tabs. All this under TinyXP of course, for as much available RAM as possible. Seems like I'll be using this machine for a little longer! about 2 years ago ,i had a PC with 256MB RAM and had a lot of difficulty browsing the web as the latest versions of Firefox,chrome and opera would crash due to lack of memory.browsing sites like Facebook was out of the question.at that point of time i installed k-meleon and flashpeak slimboat and used to use them regularly. use k-meleon for normal browsing and flashpeak slimboat for browsing social networking sites and video sites like Facebook and YouTube. why do i need to solve captchas' or complete word verification when i am a registered user? This is just one measure our site employs to prevent automatic BOT registrations from posting spam links. MC - Site Manager. Comodo Dragon is a great browser for users who don't like Chrome because of it's invasive google elements and people who love Firefox but just find it too slow. There is no Comodo Dragon Browser for Mac, Linux or Android. Does Comodo IceDragon download is in CNET? My Bluhell Firewall blocked a site that host the file from CNET, thus, I did not risk my pc for that. Is there any way to download IceDragon aside from CNET? Yes, the link leads to Comodo website but the download link leads to CNET. Thank you for the Softpedia link, and the other link to know about bundled softwares. I guess I will trust the one that is being hosted at Softpedia. For future reference, CNET uses a wrapped installer and is best avoided as a download source. More information here: http://www.techsupportalert.com/content/cnet-downloadcom-wrapped-install... http://www.techsupportalert.com/content/what-else-have-you-just-download... Better and safer third party download sites are Softpedia, MajorGeeks and FileHippo. MC - Site Manager. Download directly from Comodo. You can use the hyperlink in the review.